This is an upgrade for multispectral-imaging. Try building it and report back how it goes. A couple of weeks ago Joe Sommer from Penn State asked about using an orange filter instead of a red filter for single camera infrared plant health photos. He thought it would preserve more information about green light which could be useful for image interpretation. This sounded like a clever idea, so I bought a Wratten15 gelatin filter on ebay and taped a piece in front of the lens on my full spectrum PowerShot A810. The filter is really more yellow than orange. Density curves for Wratten 15 (blue line) and 25A (black line) filters. High numbers for density (y axis) mean the filter blocks those wavelengths. Both filters block all blue light and pass all red light. Only the Wratten 15 passes green light. 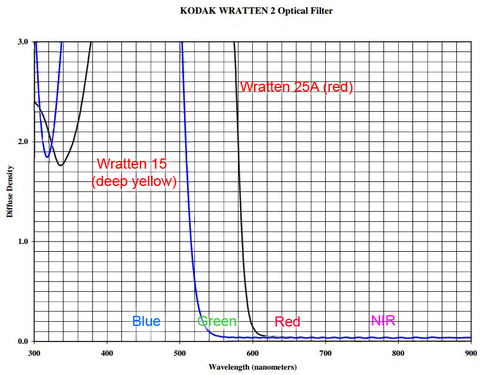 The Wratten 15 and 25A filters both work as "super-red" filters because they both do two things: they block all blue light and pass all red and near infrared light (NIR). This allows the camera's blue channel to capture mostly NIR light and allows the red channel to capture a mix of red and NIR. The red and blue channels are used to compute NDVI. The difference between the two filters is that the Wratten 15 passes green and Wratten 25A does not. So photos taken with the Wratten 25A filter have no information about green -- the camera's green channel captures mostly NIR light. Green information is not important for NDVI, but it can be used for other visualizations of vegetation patterns. 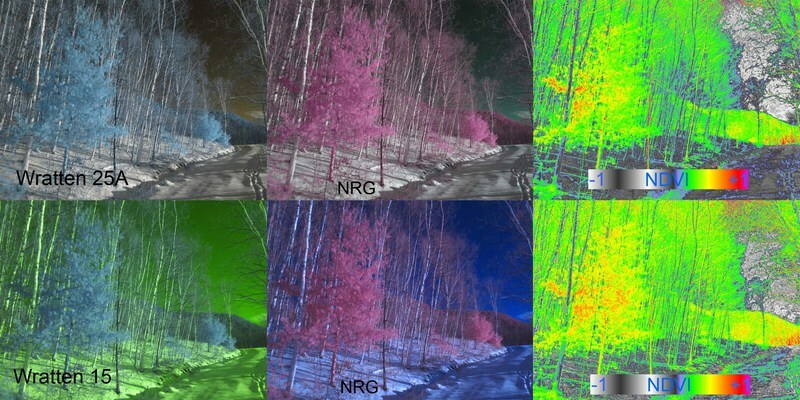 The classic false-color infrared (CIR) images which display NIR as red also display green information as blue. So you can't make very good CIR images with a Wratten 25A filter but CIR from a Wratten 15 camera could be more useful. It's not a very good time of year to take plant health photos, but these white pines should provide some idea of how the filters are working. White pine trees captured by infrared converted Canon PowerShots with Wratten 25A filter (top row) or Wratten 15 filter (bottom row). 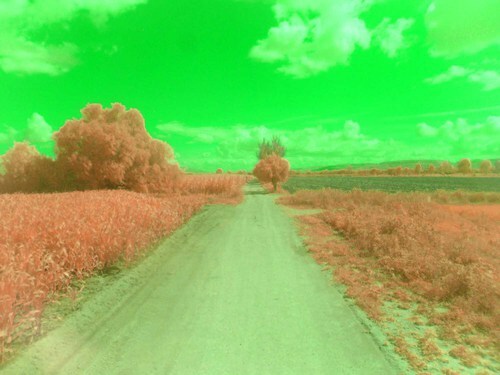 False color infrared (NRG) images are made by swapping color channels. NDVI images highlight the difference between the red and infrared channels. I did the same custom white balance on both cameras by pointing them at a piece of bright red origami paper in direct sunlight. I often tweak levels or color balance when I produce CIR or NDVI images from single camera photos, but I did not do that here to highlight the differences between the two filters. The addition of actual green light in the Wratten 15 photos makes a big difference in the photos captured by the camera -- they look very green compared to the Wratten 25A photo. The CIR images (NRG) are made by swapping color channels in Photoshop. Instead of R, G, and B data being displayed as R, G, B respectively, the CIR images from both cameras display NIR, R, and G data as R, G, B respectively. 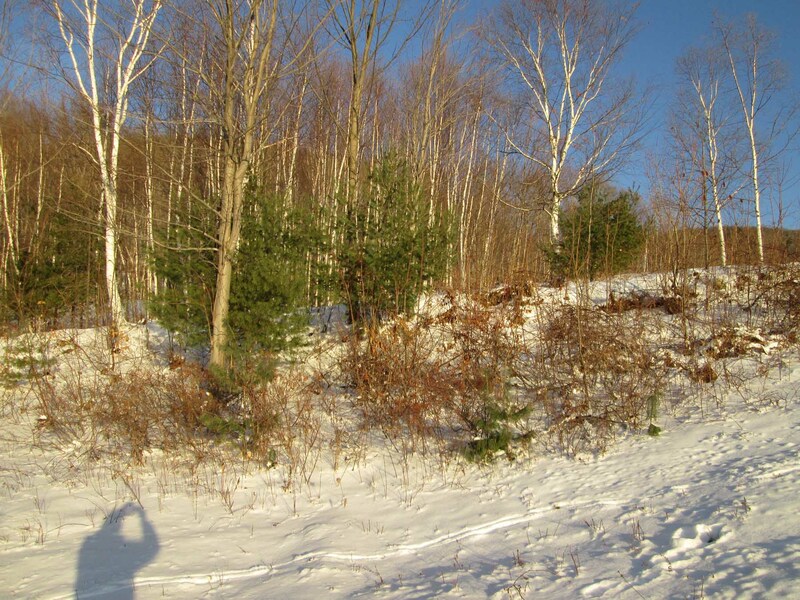 So the greenish sky and snow of the Wratten 15 photo become very blue in the CIR image because green data is displayed as blue. The sky is dark in the Wratten 25A images because the atmosphere does not scatter much red or NIR back to us, but it scatters more green so the Wratten 15 images have a brighter sky. The pine trees are less pink in the Wratten 15 CIR image and slightly closer to the reddish color of vegetation in legacy CIR images. The NDVI images look very similar. This scene was also photographed with two PowerShots with Wratten 15 or Wratten 25A filters (see below). All three of the composite figures above show pretty much the same results. 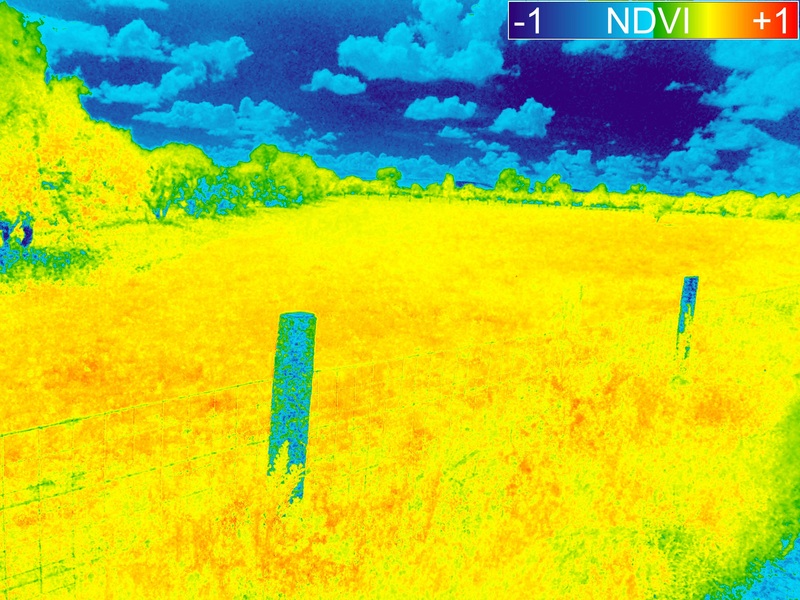 It appears that both filters will produce very similar NDVI images, but distinct CIR images. It is not obvious from these comparisons which CIR images are more useful or have more information about vegetation. We know a priori that the Wratten 15 images have more information because green data is added. It is a good assumption that those images will allow more reliable interpretation of vegetation patterns, but I don't know how much more useful they will be. I look forward to seeing some Wratten 15 aerial CIR images when lots of plants have leaves again. 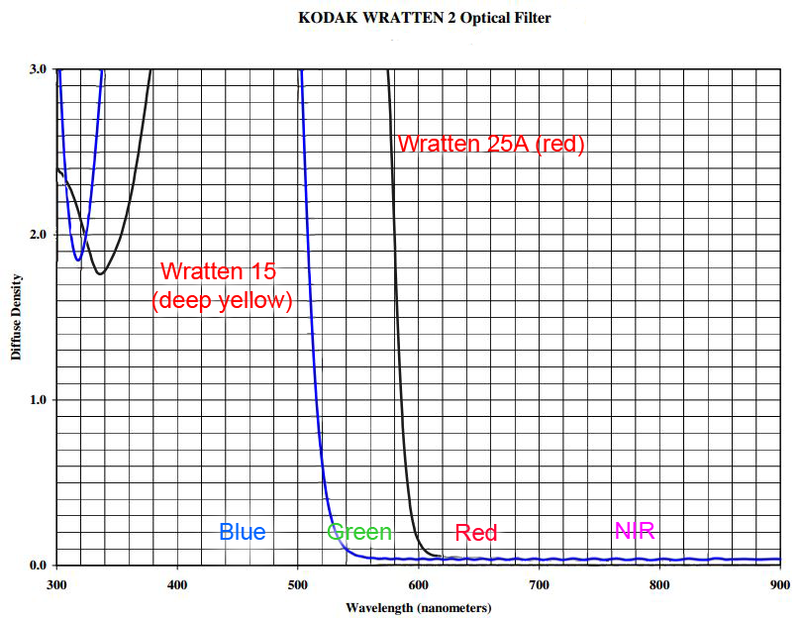 In order to capture the green information, the Wratten 15 filter has to allow some green light to be captured in the blue channel (the camera's channels have a lot of overlap). The blue channel is used as a source of NIR information, so that source is more contaminated with non-NIR data in Wratten 15 images. The Wratten 25A filter blocks everything at the blue end of the spectrum so mostly NIR gets captured in the blue channel. I don't know how much difference this will make in the interpretability of images from these filters. If your goal is NDVI, the Wratten 25A is probably a better choice because the blue channel will be purer NIR. If you are interested in CIR images, the Wratten 15 could be the better choice because green data is captured. Figure from the user manual of a Tetracam ADC camera. The "blue blocking filter" is probably similar to the Wratten 15. The Tetracam ADC camera is a commercial product for plant health analysis that uses a filter very similar to the Wratten 15. The photos from that camera might be very similar to the Wratten 15 photos above. Tetracam cameras are sold with software that does some serious post processing of the photos to make NDVI and other images. I don't know how the photos are processed, which is evident from my discussion here. That discussion of Tetracam cameras has some images attached which show the spectral response of some Rosco filters that could be used instead of Wratten 15. Wratten 12 filters are also similar and could be a good choice. You can buy a small piece of Wratten 15 gelatin filter here. ;-) can't we just choose a color and stick with it, Chris? He didn't listen when they told Thomas Edison "You've tried enough filaments." He didn't listen when they told George Washington Carver "We don't need any more peanut recipes." He didn't listen when they told Martin Luther King "No more speeches, your last one was plenty good." And I haven't really listened to anyone for a long time now. Interesting stuff indeed, I have been lurking here for a while and trying to build a good documentary NDVI camera for a public gardening project. I am hoping to try a few more filters in the next couple of weeks, seems like red may make a lot of sense. Out of interest, are the glass Hoya 25A filters similar enough to the Wratten 25A gels? Because I don't really know much about filters, I came across this company named Agribotix that do NDVI and below the next paragraph is their explanation on how they do it Does the software here at PublicLabs does this kind of analysis too ? Can these be compared ? Any comment on the way this company is doing it ? Thank you Javier "................ How do we do NDVI? We use the NIR and green channels. Traditional NDVI, developed by NASA for satellite images, used NIR and red. 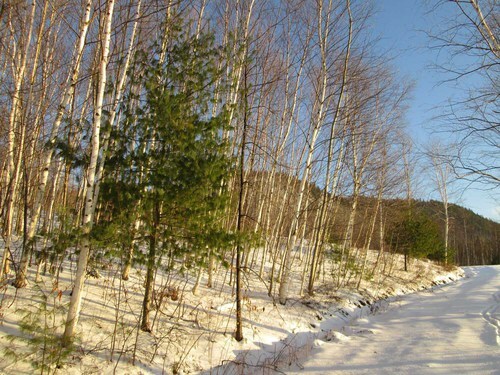 However, at lower altitudes there is no significant scattering of the shorter wavelength light so green works just fine. We usually use a variant of NDVI, called DVI, which we find stands up the better in ground truthing. In DVI, rather than normalizing by the sum of the NIR and green, we expand the histogram. It is sort of the same thing as normalizing, but from lots of hours spent walking through muddy fields we find the results are more representative of the crop on the ground. 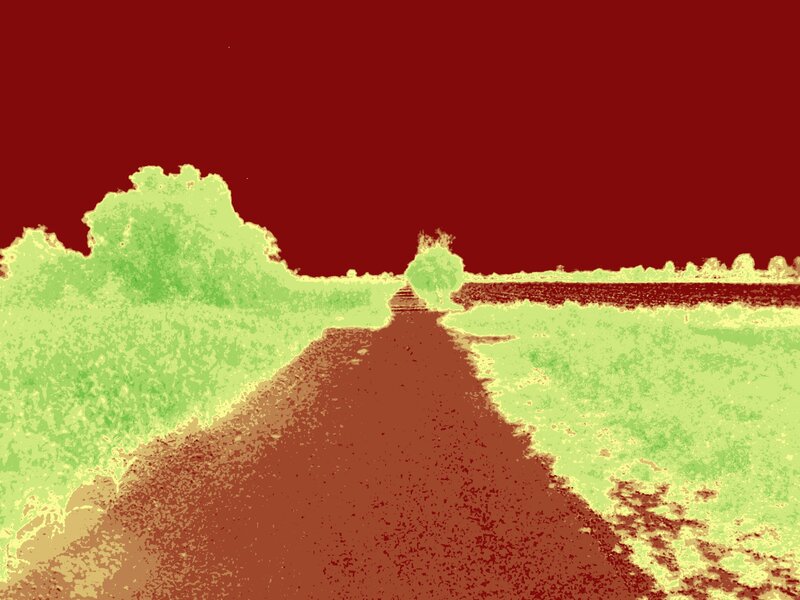 Of course we can process your images using the NDVI algorithm if you’d prefer. There seems to be a lot of marketing hooey at the Agribotix site. They seem to be doing DIY uncalibrated infrared vegetation index work like a lot of people in the Public Lab community. They have decided that green is the best visible channel for vegetation indices without mentioning some very good reasons to use red. They have decided that simply subtracting green from NIR (called DVI) is better than NDVI because the images look better to them. They "expand the histogram" without attempting to explain what that is or how it might help. They have looked at a lot more aerial infrared images of farm fields than I have, but they don't present much evidence that their approach is more reliable than many others or why it should be. They are commercializing the type of DIY approaches that the Public Lab community has been involved with. More power to them. The current version of Ned's Fiji plugin will compute either NDVI or DVI. @fgiorlando, I assume the Hoya 25A filters are just as good as Wratten 25A filters for infrared photography. The Hoya glass filters would produce clearer photos than Kodak gelatin filters. Hoya also makes a G filter which is a good substitute for Wratten 15. Hi I have been testing with one particular filter wich is the 116 Medium Blue Gree, because the 2007 was not available for sale at the moment. I am using a sigle camera to get NDVI, but I have no idea if I am going in the right direction. Colud you please help me out? Note: I took alook to the color filter thecnical data sheet, and i just came to the conclution that it looks almost as the 2007`s. This is the main reason I choose the 116. But I reaaly do not know. Here are some pictures. 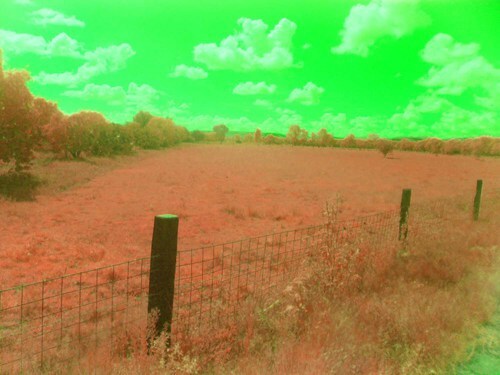 It looks like the Rosco 116 is a very good filter for NDVI. Compared to the 2007, it passes less red, has a steeper cutoff between red and blue/green, transmits more total light, and passes more green so the green channel is more useful. It seems to make very good NDVI images even without a custom white balance, which is very handy. 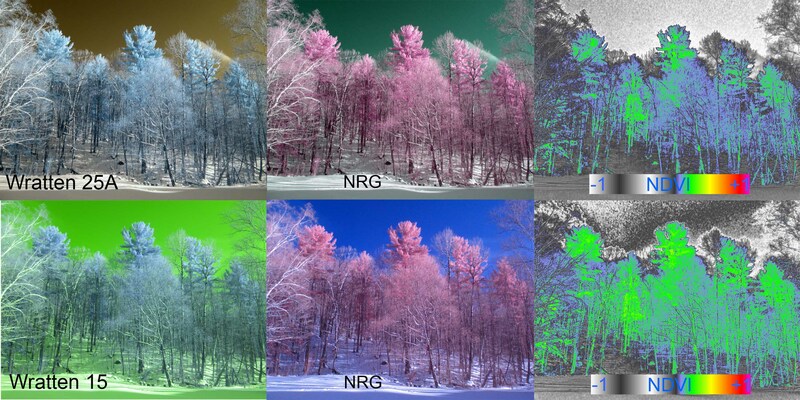 It makes good false color IR images if you swap the blue and green channels (so they are NBG instead of NRG). Here are some NBG images. The Rosco 116 seems to be a very versatile filter for this work. Hello @cfastie, thanks for your opinion it really help us out. We are so new on this issue, as I commented you on other talk we just broke a camera trying to take out the IR filter, oh my !!.. But let me ask you something that maybe I will not understand, but what does all the mixing colors have to do in the end? and how do you do it? We use the Fiji software.